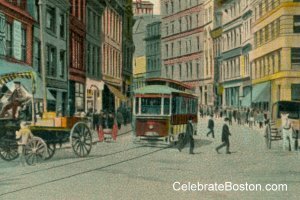 Boston was a huge melting pot in the 19th century. A wave of Irish immigrants during the 1840s was followed by other ethnicities, and then a large influx of Italians. The Italian immigrants settled in the North End district of the city. The North End was densely populated by 1900, and was considered an economically poor neighborhood with many tenements. Most Italians were hired as laborers, but many had trade skills and were also employed in the fishing industry. Bigotry and discrimination occurred against the Italian immigrants, but eventually the group assimilated into the diverse American culture as others had done before. A strange incident occurred on August 29, 1905. A large group of Italians had traveled to Sharon Heights to attend a baseball game and picnic. After they returned to South Station, a parade was formed to march back to the North End via Federal and Congress Streets. The procession was led by two men. One man carried an American flag, and the other an Italian flag. A streetcar rounded the corner at Milk Street, and disrupted the parade. The marchers insisted on proceeding, but the operator would not bring the trolley to a full stop. The flag bearers stood in front of the trolley, and then suddenly a group of rowdies boarded the trolley, beat up the operator and conductor, and smashed some of its windows. "Rallying around the American flag, a crowd of 200 or more Italians just returning from a day's outing at Sharon Heights became so incensed at the idea of a motorman of a car running through their parade that a number of the paraders jumped upon the car and assaulted both the motorman and conductor, breaking several panes of glass in the car and inflicting such painful injures upon the conductor that he had to be sent to the City hospital. One man is locked up at station 2 in Court sq. He was the bearer of the American flag in the parade and it is said that his action was instrumental in starting the trouble which followed. John Carter...was the conductor of the car. In the fight his nose was broken, his face cut in several places and he received a bad scalp wound. Bernard Lyons...the motorman, escaped more fortunately, and was able to drive his car to its destination after the trouble was over. Amelia Ferratti, 29 years old...is locked up at station 2 on charges of assault upon the motorman and assault and battery upon the conductor. The police of the Court-sq station are at work on the case and it is expected other arrests will be made. The affair created a sensation and was witnessed by a number of prominent men, who will probably be called as witnesses when the case comes to trial. The Liguorian society of the North End...had spent the day at a grove at Sharon Heights and in returning left the South station about 7 o'clock. With the Roma band in the lead, the procession, comprising about 200 members of the organization, proceeded down Federal st toward Post office Sq. Just as the last of the parade crossed High st a Charlestown-bound car came up in the rear, and the motorman rang his bell for the parades to get to one side, but they didn’t and he continued to clang his bell. The parade, according to spectators, held the center of the street, blocking both tracks. When the marchers were near the corner of Milk st and were about to swing into Post Office sq a Columbia road car, numbered 3010, in charge of motorman Lyons and conductor Carter, swung around the corner. The motorman clanged his bell for a clear track, but the parades refused to turn aside. There was considerable confusion, with the motorman in the rear and the one in front clanging their bells. Motorman Lyons failed to bring the big car to a full stop, and it is said that in a moment of excitement Ferratti, with the American flag aloft, left the side of his comrade, who was bearing the Italian colors, and dashing over to the front of the car, held the colors up in the face of the motorman with a demand that he should stop. This action proved a signal for a general demonstration upon the part of the paraders. A number feared that the comrade was in trouble and they dashed up to the front of the car. The motorman reached down and lifted the heavy iron switch stick, which he wielded aloft, but it was no use and he was thrown bodily from the car and landed on the pavement a number of feet distant. The car was still moving through the parade with nobody in charge of the motor and was in imminent danger of causing trouble. At this point the conductor jumped and ran up to the assistance of his motorman and he was pounced upon. In the melee the glass broken and the men and women passengers fled in a panic, many of them leaving parcels in the car, which were appropriated immediately afterward by others than the rightful owners. When Carter jumped from his car he was set upon, his nose was broken and he was beaten almost into insensibility, and would probably have fared worse but for the timely arrival of the police, who put an end to the disturbance and scattered the crowd. The parade dispersed and the paraders made their way home by various routes. Ferratti was captured and escorted to station 2, where he was examined and the names of several other paraders secured. The police went out looking for them...."